Gulf Coast Birds + Blog Post of the Week – Trees & Flowers & Birds! If you follow me on twitter then you saw my statement that I know I will not be able to look at any of the photos of oil-covered birds that will be appearing as the oil spill continues and spreads to the shore line. I couldn’t handle the Exxon-Valdez photos either. I love our feathered friends too much. I feed them in my yard. It’s one thing when the circle of life takes them out (I have no problem watching a Coopers Hawk lunch on a Mourning Dove! ), but when we humans do it – UGH! Thanks to my membership in the Feeder Watch program, I’ve been on the Cornell birding sites and they are magnificent. All About Birds just won a Webby award and a quick visit shows they deserved it. Fabulous photos & sound files and data on bird populations including a section on the birds most likely to be impacted in the Gulf. 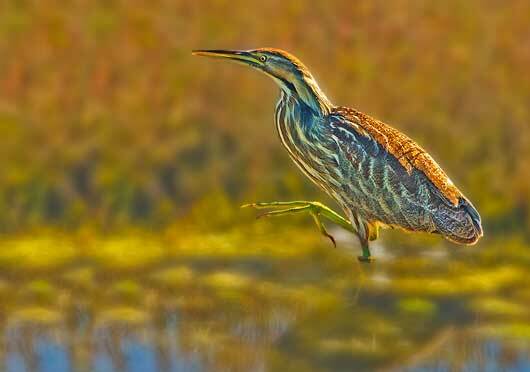 Like the American Bittern shown above. E-Bird is another great site (they work with Cornell’s sites) and I joined that with the intention of reporting what I see especially when I am out on the trails. My overall opinion of course, is that anything that harms ecosystems and species the way offshore oil drilling does should be looked at long & hard before we embark on any more of it. Regulate, regulate regulate, and oh, how about the agencies in charge of those regulation actually ENFORCING them rather than (literally) sleeping with and doing drugs with the industries you are supposed to be policing? Yeah, that’d be a change. I’m disappointed that the cleanup of the Interior Department has been so slow, but am heartened by the response I am seeing from Sec Salazar and some of the changes he’s already made. Meanwhile my heart aches for the birds & the fishermen of the region. Ok – blog post of the week! This is technically a guest poster on this site, but he just blew me away. Jane, at PlainJane was diagnosed recently with breast cancer and she had double mastectomy surgery this week. It all went well and thanks to the many Cancer-Be-Gone vibrations sent her way (I’m sure it was all our doing, right?!) there were no indications of anything having spread and all offending cells were removed. Still, this was quite the ordeal and we were all on pins & needles sending out those powerful vibes. Thankfully he angel of a husband kept us posted. At first they were perfunctory, “here’s what is up” style updates. Then on Wednesday he posted a detailed update not just on Jane but also on the kids and on him and how he was handling everything. I hope it was cathartic for him to write. It is stunning beautiful and I do advise having a tissue handy. Hello, I love you, wont you tell me your name? I like the Cornell birding sites, too. They’re great. And, like you, I can’t watch coverage or look at pictures of birds covered in oil. It’s too heartbreaking. Hi, I just released a new song “Fly Forever in My Heart” for Gulf Coast birds affected by the oil spill disaster. Hope this might help and be of interest here. “When the world is lost in the dark, there you are – fly forever in my heart,” sings Woods, a Los Angeles Music Award winner approaching half a million views on YouTube and greatly influenced by the 70’s pop of Elton John, Barry Manilow and Jackson Browne. “Fly Forever in My Heart” can be downloaded for free at http://www.KennyWoods.com and the accompanying video viewed at http://www.YouTube.com/KennyWoods.